When it comes to looking forward in 2019, keep in mind is that our planet is experiencing something not known in modern times - and it a fashion never experienced; a falling population in parallel with an aging of the population. 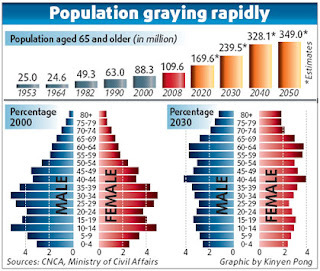 While looking for what is happening in China, you cannot decouple the demographic stew it is all happening in. It is our nature to look back in order to find a useful benchmark to see where the future may take us. When thinking of China, the rise of Imperial Germany and Imperial Japan come up on a regular basis, but I think they are very limited benchmarks. They both rose in a time of rapidly advancing populations that gave their collective population a forward looking, aggressive outlook - and leaders a large population of surplus males. It is one thing to ask a family to lose one of three sons, it is quite another to ask them to lose their only son and child. Births in China dropped to the lowest level in almost 60 years in 2018, signaling the country’s looser two-child policy has done little to reverse its slowing birthrate, and worsening the outlook for growth in the world’s second-largest economy. The number of babies born last year fell by some 2 million from 2017, to 15.23 million, data from the National Bureau of Statistics showed on Monday. Demographer He Yafu said it was the least since 1961 and the third-lowest since the founding of the People’s Republic of China in 1949. A top Chinese research institution projected the population could start shrinking as soon as 2027 -- three years earlier than expected -- if the birth rate held steady at 1.6 children per woman. The population -- at 1.39 billion in 2017, and the world’s largest -- could fall to 1.172 billion by 2065, it said. China’s State Council last year projected that about a quarter of its population will be 60 or older by 2030 -- up from 13 percent in 2010. China’s labor force fell by 4.7 million in 2018 -- the seventh consecutive year of decline. Where is the inflection point where a nation is too focused on caring for its elderly to go to war? How does that impact military spending? In parallel, how does that fit when the economy underperforms? China on Monday announced that its official economic growth came in at 6.6 percent in 2018 — the slowest pace since 1990. That announcement was highly anticipated by many around the world amid Beijing's ongoing trade dispute with the U.S., its largest trading partner. Economists polled by Reuters had predicted full-year GDP to come in at that pace, which was down from a revised 6.8 percent in 2017. Fourth quarter GDP growth was 6.4 percent, matching expectations. That was a decline from the 6.5 percent year-over-year growth in the third quarter of 2018. Now that China has a President for Life, how does the Communist Party manage popular unrest by replacing leadership as a way to release pressure for action when things hit a rough patch? Things are more complicated - and unclear - than I think we appreciate.